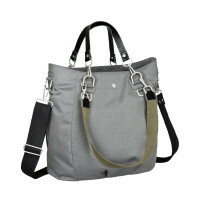 The Green Label Mix 'n Match diaper bag made from recycled polyester offers plenty of versatility. It is a lasting companion for any mother who likes to be individual. 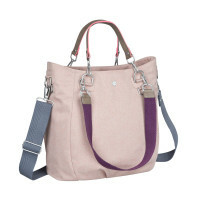 Product information "Mix 'n Match Bag, rose"
description & equipment The Green Label Mix 'n Match diaper bag made from recycled polyester offers plenty of versatility. It is a lasting companion for any mother who likes to be individual. This master of adaptability comes with three shoulder straps in various lengths, which can be swapped as you need or want like. Since they are also made in part from different materials, the straps can be recombined in a variety of ways to achieve that special look. 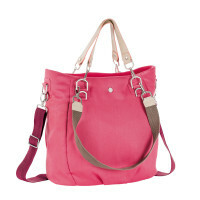 With just a few simple adjustments, the bag can be carried in the hand or worn on or over the shoulder. 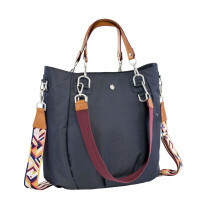 There are also matching purses so that the woman is perfectly equipped for running around town or just going for a walk. 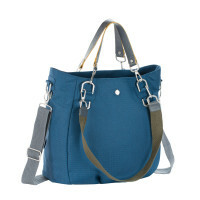 Like all other diaper bags, the Mix 'n Match Bag has numerous accessories to make diaper changing on-the-go as convenient as possible. Also included are a water-repellent changing mat, insulated, removable bottle holder, accessories pouch, water-repellent wet compartment, removable baby food jar holder, stroller attachment, key chain and integrated cellphone pocket. 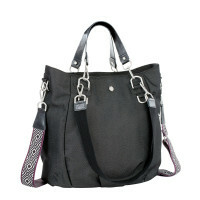 And when the child is no longer in diapers, this ecological allrounder is the perfect handbag for the woman on the go.